Hibernian striker Anthony Stokes is poised to sign for Celtic after agreeing a £1.2 million move. Celtic are on the verge of completing the signing of Anthony Stokes after the striker travelled to Glasgow to complete a medical. The Hibernian forward was given permission to discuss terms after the Edinburgh club reached agreement with Celtic over a transfer fee, believed to be £1.2 million. Celtic’s interest in the former Arsenal and Sunderland striker was confirmed by Neil Lennon over the weekend and the Glasgow club entered into talks with Hibernian over a fee. An initial offer of £800,000 was reportedly rejected by Hibs chairman Rod Petrie, who demanded a substantially higher fee. Following negotiations, the clubs have now settled on a figure and Stokes is expected to be unveiled as a Celtic player on Monday afternoon. "He is an option and is a player we like," Celtic manager Lennon said before his side’s 4-0 defeat at Utrecht on Thursday night. Stokes came through the ranks at Arsenal and was a huge hit while on loan at Falkirk in the 2006-07 season. He subsequently moved to Sunderland but failed to hold down a starting place and was sent out to Sheffield United and Crystal Palace on loan. John Hughes brought the forward back to the SPL last summer and Stokes found his shooting boots again. 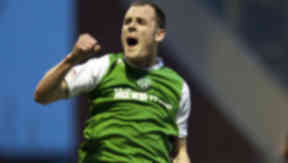 The striker found the net 23 times for the Edinburgh club last season, becoming Hibs top scorer. Celtic have been busy in the transfer market already this summer and have now made further changes in the striking department. Gary Hooper has been recruited from Scunthorpe United but is sidelined until October by injury. Marc-Antoine Fortune was sold to West Bromwich Albion last week and Morten Rasmussen has gone out on loan to Bundesliga side Mainz meaning Lennon was keen to add more firepower to his squad. Hibs have moved quickly to line up a replacement, drafting in former Falkirk striker Darryl Duffy on a season-long loan deal from Bristol Rovers.